This weekend was Dig It’s May Summer Show. Saturday was my first official judging appointment for UKA. I was excited but nervous; what if I mess up, what if I make a big mistake, what if people don’t like the course?! Turns out I thoroughly enjoyed it! It rained and poured and hailed but I wrapped up warm and with full waterproofs on I stayed nice and dry. Despite the weather everyone’s spirits were high and the atmosphere was friendly and positive. Amanda the UKA rep was really supportive and helpful as were all of the Dig It crew and it was nice to be amongst friends. I found it really relaxing to stand and watch dogs and handlers running, and not worrying about anything else. The only difficulty I had was remembering the courses! I’d set up the course, step away while everyone walked it, and then when we were ready to start I’d realise I wasn’t sure where they were suppose to be going! Something I got better at as the day went on. The entry numbers were low which made for a lovely show. 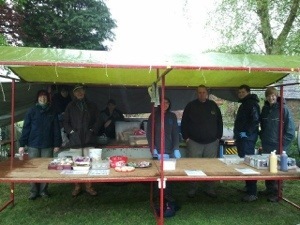 My Scout group were there doing a BBQ and cake stall and all the cakes sold out. On the pedometer I clocked 12,000 steps from when I stepped out of the house that morning to head to Dig It to when I got home! Phew. On Sunday it was my turn to compete with Guinness. We opted for a slight lie-in as Veteran/Anysize was before my class. Having spent the winter using Dig It Winter Series Shows to train in the ring our aim for the day was to run to win! 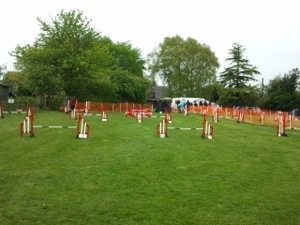 Agility went very nicely with Guinness comfortably waiting on the start line for both runs! Something we’d really struggled with at shows so far. His contacts were spot on and he ran well, but with a few little mistakes due to me and we picked up faults on both runs. However we came 1st with 5F!! There were no clear rounds & our time was 2 seconds faster than 2nd place. The entry numbers were quite low again but Guinness’ time really gave me hope for his future potential. Jumping wasn’t quite as good with Guinness not being comfortable on the start line, possibly due to it being closer to the netting. We went for a running start and he ran nicely, but struggled with a tricky rear cross section. Still the time was good and we came 3rd! Steeplechase saw me forget a course for the first time ever! We had some poles down, missed a jump, and as I’d realised I’d gone wrong we just went for a fun blast round to finish. Never mind! The surprise of the day was my mates all deciding I would have a turn at running my friends Labradoodle while she was judging. She is a gorgeous, patient dog and used to being run by other people and she quickly become my best friend for a bit of cheese. 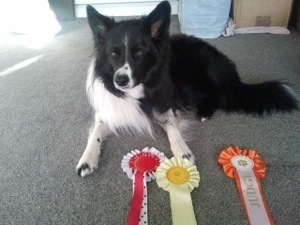 I took her for Intermediate Agility and we had a lovely run, managing to go clear. It was really enjoyable to run a different dog that followed my directions almost as if I’d trained her myself. The first tingles of cravings for a 2nd dog started in my belly! Low and behold we came 2nd!! Overall it was a fabulous weekend! The weather was awful but the laughter was loud! There’s something special about Agility people that will come out in the rain and have a great time, hanging around to support each other and socialise. I think all the miserable people stayed dry at home!